Hi guys, I'm calling your attention again. I just want you to give me a favor for the second time. I actually need some votes. I really wanna win this cute sushi pillows from KawaiiJunkie. And oh, I have joined a contest @ Wan Ting's blog. 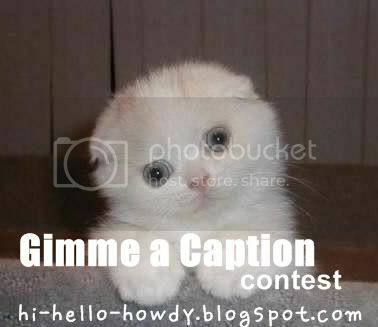 It's about giving a caption to this cute little cat. The last one was to make the additional points add up to 20. A banner for you to keep. Like of course lah. An advertising spot on my blog for 3 months. 3 guest posts. Means, you write 3 posts and they'll be posted on my blog. Some thing like that lah. A banner for you to keep too. An advertising spot on my blog for 2 months. A banner for you too. your drawing are really cute!